Hunt area consists of about 1200 acres and measures approximately 1.5 miles by 1.25 miles. Topography in the hunt area consists of large flats broken by long steep draws, up to 125 feet deep, throughout the entire area. A herd of 25 to 60 animals will be ranging throughout the area. The hunt area can be driven into with a pick-up or 4 wheel drive vehicle, but the hunter should be prepared to walk during the hunt. 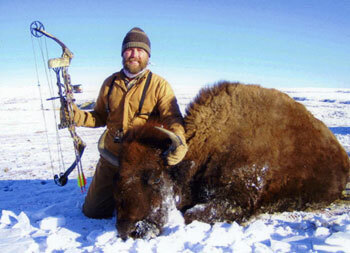 Depending on the hunt format: modern rifle, muzzle loader, archery, etc. the amount of walking could be substantial. 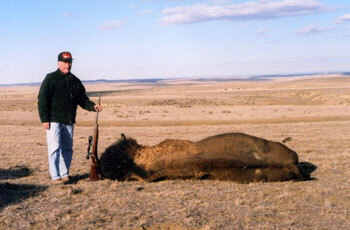 The hunt will be guided at all times by Silver Sage Bison Ranch. After harvesting, the animal will be transported back to the ranch headquarters where it will be skinned and prepped for transport. 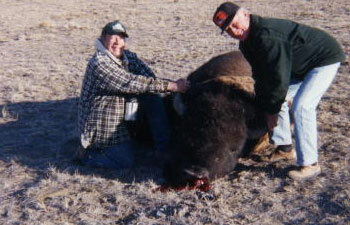 The hunter needs to be prepared to transport a large carcass. A lunch is provided for the guest on the day of the hunt. 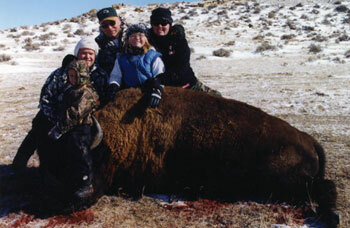 We normally schedule hunts from the 1st of November through the end of February. However, we will try and accommodate your schedule if those dates aren’t convenient for you.